​RSVP to us before March 1 at CampBethelOffice@gmail.com or 540-992-2940. 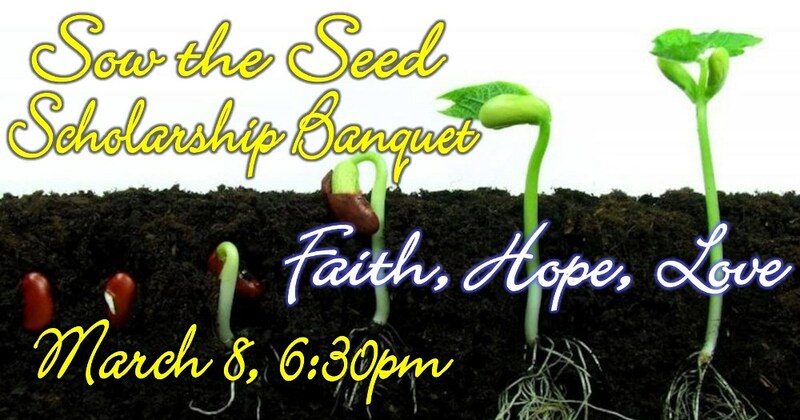 SOW THE SEED SCHOLARSHIP BANQUET, THURSDAY, MARCH 8, 6:30pm: Plant seeds of FAITH, HOPE, and LOVE in the lives of children, youth and young adults! At $50 per person (larger gifts accepted), all costs and donations from the evening directly fund "camperships" and our summer camp ministries. Sow the Seed Banquet includes an excellent dinner with an *easy* and fun "Not-so-trivial" Trivia Game Program. Come one ($50 per plate) or assemble your dream table of 8 ($400 per table) for this not-so-competitive night of fun, all for Summer Camperships. Our 5 Trivia Game Program topics are: The Natural World; Bible 101; Camp Bethel Facts; Word Play; and People and Places in Virginia. ​In summer 2017 we granted full or partial Camperships to 87 children totaling $25,715. We need your help! Please consider donating $330, the 2018 cost for a child to experience one week of camp. Mail checks with memo "Camperships" or donate at www.CampBethelVirginia.org/donate.